I was at Moray House for his recent retrospective presentation, and took a photo that I quickly grew fond of, and so did someone at Moray House; although I originally processed it in monochrome, they requested a coloured version for their inaugural magazine “Ku’wai”, as a non-profit organisation and one that supports the Arts in Guyana I really couldn’t say no, and I was honoured that they wanted it for the cover of the magazine. Since I had only uploaded the monochrome processed version to Facebook, I decided that the coloured one worked nicely and I would also use that for the Deck Project. 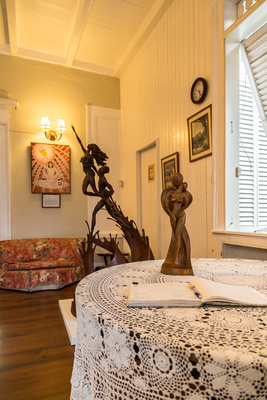 The piece on the table was loaned to the presentation by the current owner, the one in the background is called “Saving Seeds”, it was the piece that placed third in the 2012 Guyana Visual Arts Competition and Exhibition; to my understanding, it is a wire-framed structure covered with a material that Winslow made called Sawdue (sawdust and glue). Click on the image to see it in the Gallery, and to see Winslow’s current entries in the 2014 GVACE, visit the GVACE 2014 Exhibition which opens on Thursday 18th December 2014, exhibition of pieces are likely to be at Castellani House and the National Museum.